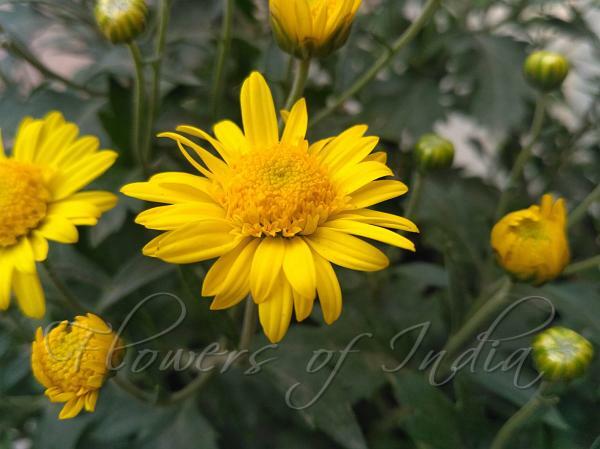 Indian Chrysanthemum is a perennial herb, 25-80 cm tall. 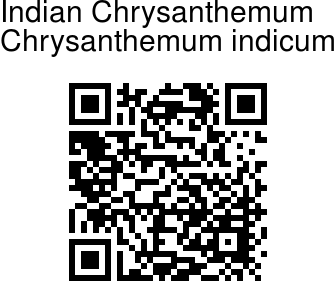 It is one of the main parents of the florists chrysanthemum in horticulture. Flower-heads are many or few. Phyllaries in 5 rows, scarious margin broad, white or brown. Ray floret are yellow, 1-1.3 cm, tip entire or 3-finely toothed. Flower-heads are borne in a lax flat-topped cyme at branch-ends. Stems are erect or spreading, branched, sparsely hairy. Lower leaves wither at anthesis. Middle stem leaves are carried on stalks 1-2 cm; leaf blade ovate or elliptic-ovate in outline, 3-7 x 2-4 cm, both surfaces pale green or olive, sparsely velvet-hairy, pinnately cut or lobed, base flat, somewhat heart-shaped or broadly wedge-shaped. Seed-pods are 1.5-1.8 mm. Flowering: June-November. Medicinal uses: The plant is used in China to treat eye ailments. In conjunction with black pepper it is used in the treatment of gonorrhoea. The leaves are depurative. They are used in China in the treatment of migraine. The flowers are used in the treatment of furuncle, scrofula, deep-rooted boils, inflammation of the throat, eyes and cervix, eczema, itchiness of the skin and hypertension. They have a rejuvenating effect when used over a long period of time.